(March 18, 2013) This past weekend, ISNA and Muslim communities across the country spoke out against gun violence as part of the “National Gun Violence Prevention Sabbath” from March 15 to 17. In Louisville, KY, the Louisville Islamic Center, Muslim Community Center, Guiding Light Islamic Center, and Bosniak-American Islamic Center all delivered sermons on preventing gun violence. From the West to East coast, Muslim and other religious communities raised awareness about gun violence and steps we can take to prevent it. 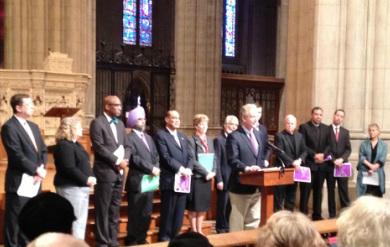 On Saturday, Dr. Sayyid M. Syeed, ISNA National Director for Interfaith and Community Alliances, joined other leaders of Faiths United to Prevent Gun Violence at the Washington National Cathedral to lament the lives lost, unite with a common purpose, and act for positive change. Victims’ families, survivors, interfaith leaders, lawmakers, urban community leaders, and people of all faiths and perspectives gather for a series of panel discussions and an interfaith service. Religious communities throughout the nation gathered to reflect and act on preventing gun violence, including requiring background checks for all gun sales, removing assault weapons and high-capacity magazines from our communities, and making gun trafficking a federal crime. Dr. Syeed and other faith leaders also joined Mayors Against Illegal Guns to release a video, calling on Congress to take action by passing sensible legislation to curb gun violence.